A second-tier Chinese city! Not even Charles Dickens could use such a beginning to entice readers into a novel ostensibly about the failure of a middle-age romance, the emptiness of an internet chat room, and the futility of an intellectual discussion group. That this novel has been suppressed in China cannot dispel the apprehensions of a reader who knows that it will lead him through a series of philosophic disputes (sometimes through a Marxian prism). But those who would overlook this work will miss a treat. 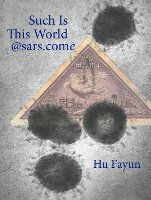 Delicately spiced with Chinese cultural allusions, Such Is This World @ SARS.come offers a keen look at China as she staggers away from the horrors of her recent past towards the modern world. The story takes place during the SARS crisis of 2002-2003. The heroine is a widow named Ru Yan, whose son is studying abroad. As a going-away present, he leaves her with a puppy and a computer and teaches her how to use the Internet. Adopting the moniker “Such is This World” (a pun on her name), she joins a chat group called the Empty Nest and makes a mark by her perceptive and sensitive posts. The Empty Nest in turn introduces her to an intellectual discussion group featuring “Teacher” Wei, an erudite old revolutionary who had been humiliated and exiled during the Cultural Revolution and two of his disciples, one a philosophy professor and the other a computer repairman. At the same time, Ru Yan’s boss sets her up romantically with Liang Jinsheng, the deputy mayor of their city. Although his charm and status enable him to dazzle as a courtier, Liang’s overloaded schedule and the political pressure he constantly faces hamper their budding romance. SARS with its mysterious outbreak and apparently inexorable spread strikes these little worlds like a typhoon. Behind their outward tumults, we discern parallel philosophic conflicts (do not fear – author Hu Fayun sets them up with clarity and brevity). A few examples: duty challenges love; patriotism clashes with honor; censorship tries to stifle truth, while result-driven sophism fences with intellectual rigor. As one Machiavellian subordinate warns Liang, “If reasons are needed, reasons can always be found.” As she stumbles through squall after squall, Ru Yan clings to everything she holds dear, from her concern for the public health to her loyalty to her friends to her dog whose life is threatened by a public-safety edict. Author Hu moves his tale briskly and delights the reader with literary and cultural allusions. I particularly enjoyed the philosophic look at the beauty of perfect handiwork by a peasant and Teacher Wei’s comparison of a third wife to the third infusion of water into the teapot, so praised by connoisseurs. Andrew Clark brings out Author Hu’s brilliance not only with his flowing translation but also with 50+ pages of fascinating and instructive notes, some based on correspondence with Author Hu, and all offered with gentle wit. It would be easy but superficial to read Such Is This World as a wholesale condemnation of today’s China. China is indeed a police state whose government can censor with a heavy hand. But unlike the callous dogmatists who led China of the Cultural Revolution, the most authoritarian characters in Such Is This World are realistic people trying to stop the spread of SARS and to prevent it from upsetting the economy of their city. And is China the same ten years later, as the Bo Xilai saga transpires? We might also reflect on our own society, where political correctness and demagogic use of opprobrious labels – from “unpatriotic” to “racist” – stifles thought and expression nearly as effectively as official censorship. Such Is This World is well worth reading, and especially for Americans. Let us hope that it will generate a more active interest in China and a deeper understanding of her struggle to establish her identity in this new century. Let us also hope that it will lead us to look introspectively at how we use our own powers of reasoning and how receptive we are to those stubborn things called facts. Mr. Windels is a New York attorney with interests in modern Chinese culture, United States political history, and Classical literature. Copyright © 2013 Paul Windels III. Used by permission. Best viewed with Mozilla Firefox.